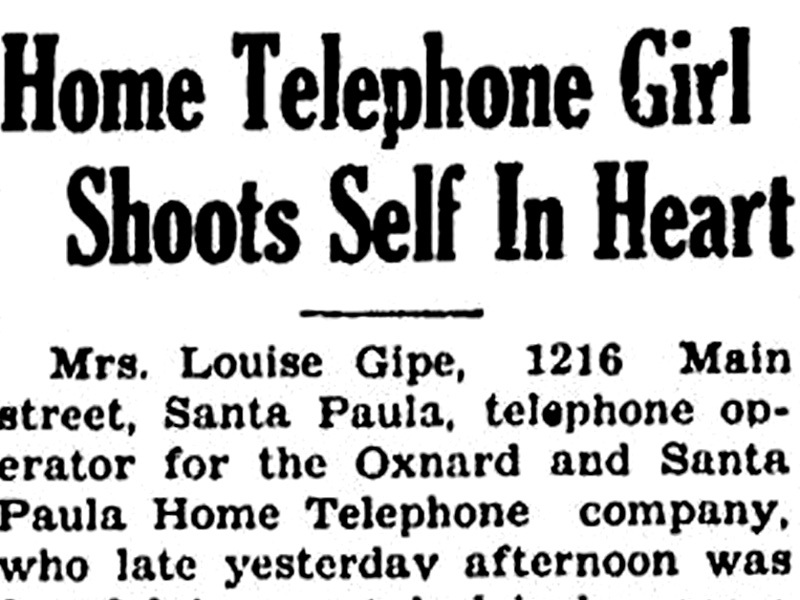 Louise Gipe, a telephone switchboard operator in Santa Paula, stayed at her post throughout the early morning hours of March 13, 1928, depite not knowing whether the deadly floodwaters would hit her. Los Angeles Herald Examiner photograph by Moss Photo. Published March 28, 1928; extended caption reads: "From districts swept by the St. Francis dam flood came more stories of heroic phone operators who stuck to their posts and saved scores of lives at risk of their own. Louise Gipe received and spread the first alarm at Santa Paula." 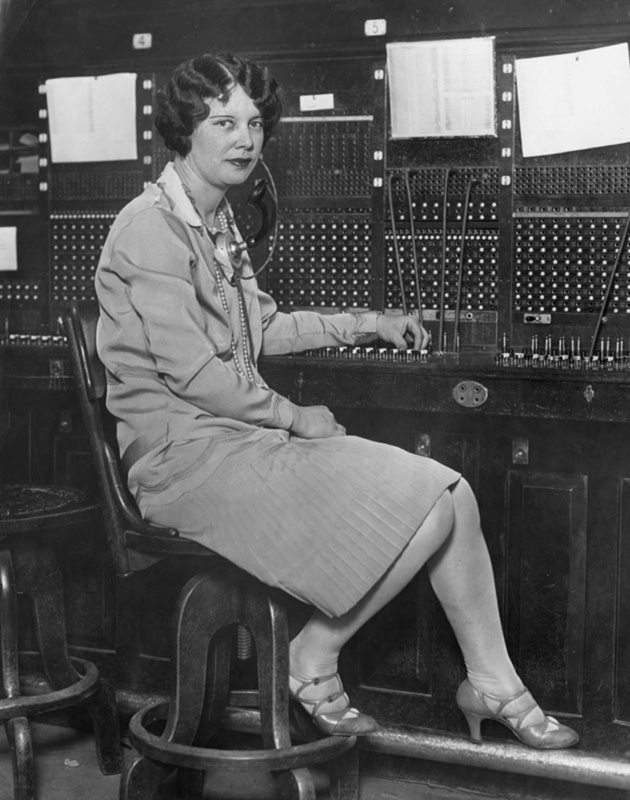 According to historian Cecelia Rasmussen, "Courageous telephone operators, including Santa Paula's night operator, Louise Gipe, stayed at their perilous posts, calling frantically ahead, trying to outrace the flood by telephone. They became known as the 'Hello Girls'" (source). Shortly before 1:30 a.m. on March 13, 1928 and urgent message of imminent disaster reached the night operator Louise Gipe in Santa Paula and was quickly relayed to police officers Thornton Edwards and Stanley Baker, city officials and then homes in the lower portions of town. Among the many heroic acts that evening were the actions of these two motorcycle officers who rode through the night to warn the sleeping citizens in the low lying areas of Santa Paula that a torrent of water was about to inundate their homes. Their heroic efforts saved hundreds of lives. Their wild ride that night was stopped at 3:05 a.m. when the 30 ft. high wall of water swept through Santa Paula on its way to the ocean. The monument depicts that specific moment in time. While the wild motorcycle ride was occurring Louise Gipe and the rest of the "Hello Girls" bravely stayed at their post knowing only that the wall of water was over 100 feet high when it left the dam. They had no way of knowing how high the floodwaters would be by the time they reached Santa Paula. They only knew that their neighbors must be warned. 1. Cecelia Rasmussen is an officer in the Historical Society of Southern California. JB2804: 19200 dpi jpeg from smaller jpeg from the Herald Examiner Collection at the City of Los Angeles Public Library, HE box 102, LAPL 00095916.